Cutting-edge 2-stroke technology, combined with a precise 6-speed transmission and hydraulic clutch are the foundation of the KTM 85 SX’s superiority in all junior racing competition. 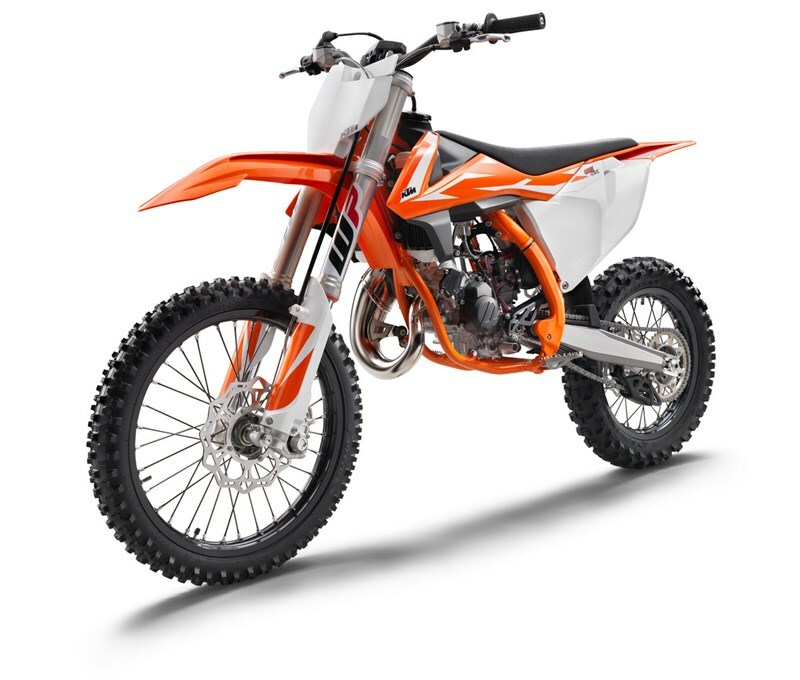 The new KTM 85 SX engine uses the latest technology to deliver unrivaled performance in the competitive 85cc class. With an unchanged bore and stroke, the engine is 1.5 pounds lighter and delivers improved power and rideability along the complete rev range. Key to the engine is a new power valve which allows the power delivery to be tailored simply and more effectively than before. The new cylinder has an unchanged bore and stroke (47/48.95mm) with new ports to improve performance and response. Additionally, it is designed around an all new power valve system. This system controls both the exhaust valve and the sub exhaust port for significantly improved power, torque and controllability. As a result, the KTM 85 SX receives a significant increase in mid-range performance reducing the need to use the clutch in loamy or sandy conditions. An adjuster screw allows the opening timing of the power valve to be adjusted to suit rider preference and track conditions and by changing between different power valve springs (available in the KTM PowerParts catalog). The all-new crankshaft is now lighter with optimized balancing to reduce vibration and oscillating mass. Even after removing this weight, the rotational inertia of the crankshaft has increased by 1 pound, improving torque and rideability. Thanks to its perfectly sized lightweight connecting rod, the crankshaft is distinguished by minimum vibrations and maximum durability. The hydraulic clutch mechanism by Formula ensures an easy clutch action and well-defined modulation on the KTM 85 SX. Replacing the previous coil spring design, the KTM 85 SX features a new diaphragm spring clutch. The new design is 0.8 pounds lighter, more compact and also benefits from added durability. The new exhaust system is perfectly suited to the engine’s power characteristics and contributes to the outstanding performance and rideability. The pipe is made in a 3-dimentional stamping process by WP Performance Systems. Once the components are shaped they are robot welded to ensure the highest level of quality and durability. The new silencer is 50mm shorter, improving mass centralization. The Formula braking system with radial calipers – four pistons in front, two in the rear – with lightweight wave brake discs – front 240mm diameter, rear 210mm – are the ultimate in terms of controlled action and braking performance. What is good for the bigger KTM off-road bikes cannot be bad for the 85 SX: an air filter change can be done within seconds without tools. Professionally crafted by WP Performance Systems, the chromium molybdenum steel frame is constructed using hydro formed tubes joined by precision robot welding to ensure the highest level of consistent quality. The frame sees a weight saving of nearly a pound and features a new geometry aimed at tailoring flex characteristics for improved handling and comfort. As a result, and in conjunction with new laterally mounted cylinder head mountings, the torsional rigidity is increased by 7% while longitudinal stiffness is reduced by 25%. This allows the frame to move in harmony with the suspension effortlessly soaking up big hits while also delivering improved agility and high speed stability. Additionally, the frame is fitted with new ´No Dirt´ footpegs which prevent the build-up of dirt collected through deep ruts and muddy terrain. The simple but effective self-cleaning system ensures the footpeg returns to its original position providing complete control in all conditions. The frame is finished off in a highly durable powder coating with standard frame protectors. Made from lightweight aluminum, the new subframe features a shorter and more compact profile. It is now 75mm shorter and 0.5 lb lighter, which not only contributes to the overall weight reduction but also improves mass centralization. Up front, the WP AER 43 consists of a split fork design using a capsuled air spring in the left leg and the trusted oil damping system in the right leg. The new components offer a significant improvement in suspension performance with a reduction in weight of 2.2 pounds and an increase in wheel travel to 280mm total (+10mm). Additionally, adjustment is made simpler thanks to the single air pressure valve and supplied fork air pump for preload and easy access clickers for compression and rebound.